Dr Dzulkefly Ahmad asks if the collapse of the deal between TRX City and a Malaysia-China consortium has something to do with the unhappiness of Malays over the sale of too much land to China. 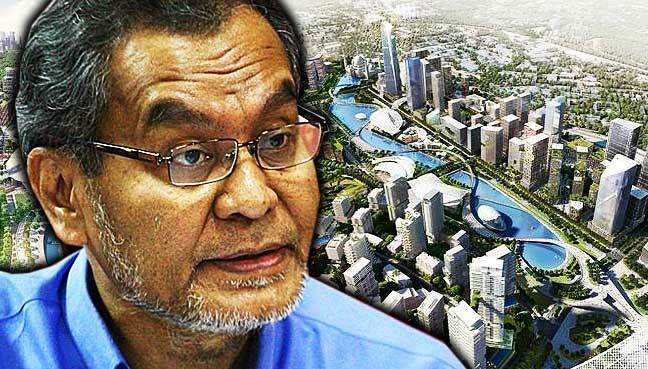 KUALA LUMPUR: Is the abrupt termination of the share sale agreement (SSA) between TRX City Sdn Bhd and a consortium appointed as master developer of Bandar Malaysia a business decision or a political decision, asks an Amanah leader. Dr Dzulkefly Ahmad, Amanah strategic director, asked if it had anything to do with talk that the government was selling off too much land to China. On May 3, TRX City, which comes under the finance ministry, announced that the SSA with Iskandar Waterfront Holdings Sdn Bhd (IWH) and China Railway Engineering Corporation (M) Sdn Bhd (CREC) regarding the sale of 60% of the issued and paid-up capital of Bandar Malaysia Sdn Bhd had lapsed. It said this was due to the failure of the purchasing parties to fulfil payment obligations. This was subsequently contested by the consortium which said it had fulfilled all the required payment obligations under the agreement. Dzulkefly said the lack of a clear explanation for the collapse of the RM7.4 billion deal had given rise to much speculation. He asked if the government had a better alternative for a master developer that will not be subjected to a regime imposing capital controls. He was alluding to reports that the deal had collapsed because China refused to give permission to CREC to participate in the purchase of the Bandar Malaysia shares due to stringent capital controls. He said going by what had been said by TRX City and the consortium, there was surely “more than meets the eye” in the collapse of the deal. TRX City, he said, should now anticipate a legal battle with IWH-CREC. My original writeup is here…………..(this is an abridged version written in BM for Akhbar Amanah in this coming issue). 1. Granted, TRX City Sdn Bhd now owned by Ministry of Finance (MoF), has abruptly terminated the RM7.4 bilion share sale agreement (SSA) with the consortium IWH-CREC of Bandar Malaysia land. 2. Executed on the eleventh hour, when Executice Chairman of CREC had flown into Kuala Lumpur with a site visit of Bandar Malaysia with the Prime Minister arranged, doesn’t speak well and surely much to be regretted, as it could be better done as to avoid a lot of embarrassment. 3. That the sale of 60% stake of Bandar Malaysia to the consortium IWH-CREC, who won ln the back of a stiff competition of 40 odd international bidders, was a big relief for the debt-stricken MDB. The RM741 million deposited by the consortium was a short in the arm of sort. 4. Going by whatever have been communicated by TRX City and the consortium, surely there are more than meet the eyes. 5. While TRX City attributed the lapse because of the many failures of the consortium to meet conditions precedent (CPs), the IWH-CREC on the other hand contested the assertion that they have failed in their key obligations. TRX City must now anticipate an ensuing legal battle by CREC and its local partner IWH. 6. Be that as it may, could the tax-payers be better informed as to what is exactly the reasons for warranting such ‘abrasive’ decision and especially not to China, an economic powerhouse that the PM Najib has courted to ‘save’ and ‘boost’ Malaysia’s foreign investment. 7. In the absence of an official explanation of the Bandar Malaysia’s collapse deal, speculations are rife and that is surely at the expense of our good will, given that we are suffering from a trust-deficit of sort from many unending predicaments. 8. Competing rivalries from other regional giants, namely Japan and South Korea are rife for other mega-projects associated with the Bandar Malaysia. The High Speed Rail is but one. Arguably TRX City would want the best offer but at what expense? 8. While TRX City may become the beneficiary of this fiasco, not the least because the land would worth a lot more than what IWH-CREC paid for, other critical considerations must surely also be factored in. 9. So, just tell the rakyat why this dramatic u-turn is needed? Do we already have a better alternative of a Master Developer that will not supposedly be subjected to a regime that is now imposing a Capital Control? Or is it after all a political decision as to allay the anxieties and concern of the Malay constituencies that we are selling of too much to the Chinese Communist Party, a once-upon-a-time taboo of the highest order to the Malay-Muslim electorates? Come clean and tell us the real truth, if you could Mr PM!